Field survey activities consisted of three consecutive dumpsite counts and one breeding survey. The multiple rubbish dumps counts demonstrated their importance as a food source for the resident Egyptian Vulture population, and their potential for being good locations for monitoring local and migratory populations. Staggering numbers, with as many as 300 individuals were recorded around some dumpsites! The breeding surveys in the Hajar Mountains confirmed the existence of breeding areas identified by Jennings (2010). The global population trend of Egyptian Vultures is decreasing, and data is confirming the importance of Oman for this species. This has been emphasized at the Egyptian Vulture Regional Flyway Action Planning workshop organized by the Bulgarian Society for the Protection of Birds (BSPB) and the Convention for Migratory Species (CMS) in Sofia, Bulgaria in July 2015. 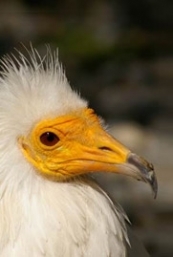 Oman potentially holds the most important population of Egyptian Vultures in Arabia and in contrast to all other countries, has a healthy and relatively large breeding population.